Great African Trophies is a photographic showcase of some of the greatest game trophies ever taken on the Dark Continent, from elephants, buffalo, and the big cats to the spiral-horned antelopes and dozens of other magnificent animals. The focus is on animals that rank in the top five of each species in the Safari Club International and Rowland Ward record books, but also included are a variety of historic, unlisted, and little-known trophies, along with their..
Great African Trophies is a photographic showcase of some of the greatest game trophies ever taken on the Dark Continent, and it includes elephants, buffaloes, the big cats, spiral-horned antelopes, and dozens of other magnificent animals. The focus is on animals that rank in the top five of each species in the Safari Club International and Rowland Ward record books, but also included are historic, unlisted, and little-known trophies, along with their stories. Trophies are interesting. They speak of experiences gained, they cement memories forever in our minds, and they evoke dreams yet to be realized. Of course, everybody would like a big trophy, but few are lucky enough to take a truly giant prize. When one does take a magnificent animal, the story behind it is worth telling, and here the author has done an exceptional job in uncovering the tales behind some of Africa’s greatest trophies. 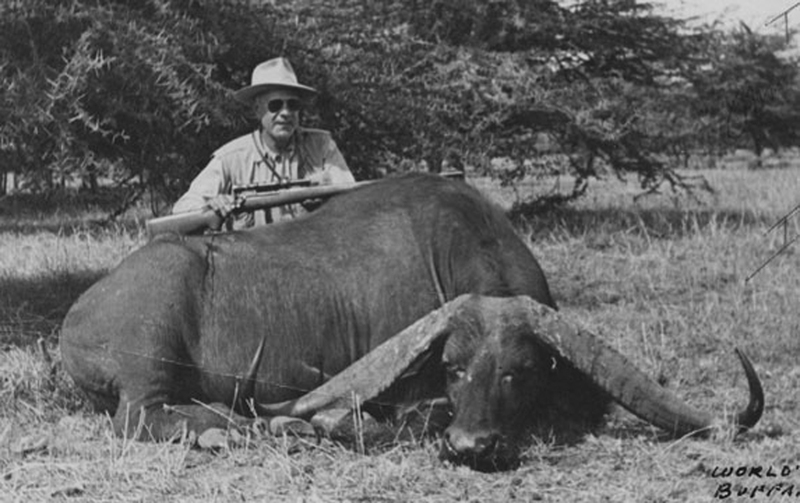 For example, there has always been a mystery surrounding which Westerner first shot a record eastern (Kenya) bongo. Various candidates with hallowed names come to the fore in the research—Chauncey Stigand, Kermit Roosevelt, George Grey—but the chances are that a relatively unknown Austrian may have been the first. 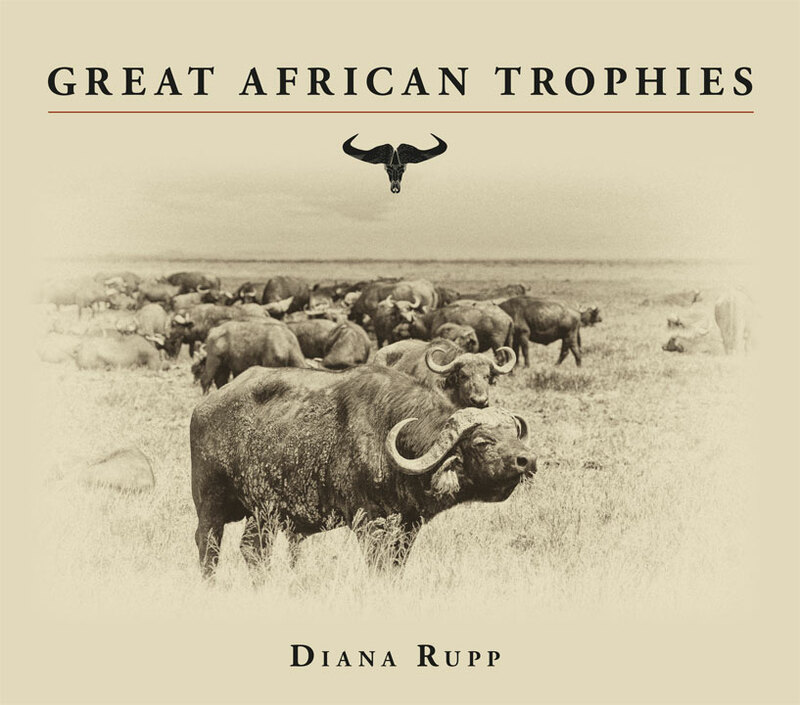 His story and the photos of his bongo are here in this wonderful new book by Diana Rupp. Likewise, you’ll find a number of large buffaloes that have been shot since World War II, but these are not your average trophy buffalo. The heads depicted in this book and the pure-luck stories that sometimes accompanied the getting of such a winning lottery ticket will be as interesting as the pictures. Sometimes—often many will say—a huge trophy is taken by pure accident. What of the huge nyala that was shot when a nonhunter spotted an animal nobody else had seen and innocently asks, “What kind of animal is that?” His story is in this book. Mountain nyalas are almost always purposely hunted and then when it is a big one, well photographed in the field. These field photos are truly a feast for the eyes. By pure accident, one fellow hunter once found a leopard skin that was easily big enough to look like a full-grown lion, size-wise anyway. It was hanging for sale in a curio shop in a remote location in Africa. It is often hard to see how big the skull of a cat is in the field, but there was no doubt in our hunter’s mind that he was looking at a champion as he gazed at the skin of a giant leopard in that far-away tourist shop along a dusty African byway. The photos of that leopard are also here in this book. Nothing fascinates like ivory, and tuskers known to be in the top ten of Rowland Ward are huge, yet there are other giant tuskers that were never recorded but would fall in the top ten, and all of these have marvelous stories to tell. Even the lowly hogs are well represented in this book. This will be the first time our readers will see the rare photos of a 1921 warthog with 24-inch tusks!! The world record bushpig? Our photos show this trophy to be almost as big as a giant forest hog . . . and entered in no record book. This book is a feast for the eyes for anyone who loves African wildlife, and it contains the best available historical and modern photos of superlative African game animals, as well as the tales—many never before told—of the hunters who were fortunate to connect with them. The photos are accompanied by a description of where, when, and how the animal was taken, and the book provides, if possible, the details of the hunt and how it unfolded. The incredible secrets behind these giant trophies are now all here in this lavishly produced tome. Be it spiral horns, the Big Five, glamour antelope, or even near-extinct species such as the giant sable, this book details all the finest trophies ever to come from Africa, and it traces the history of hunting and wildlife management over the course of more than a century. This extravagantly produced coffee-table book is glorious visual and a must for any hunter’s library. Submit your review for "Great African Trophies (Signed by Author)"